Martin Baumann is Professor of the History of Religions at the University of Lucerne, Switzerland, and research fellow in the Department of Religious Studies at Hannover University, Germany. His fields of interest are the spread and adaptation of Buddhist and Hindu traditions outside of Asia, diaspora and migrant studies, and the theory and method in the history of religions. He has published extensively on these topics, in both German and English, and is editor of the online Journal of Global Buddhism (http://www.globalbuddhism.org). Sandra Bell is a lecturer in the Department of Anthropology at the University of Durham, UK. She has published papers on the expansion and development of Buddhism in the West in the Journal of Contemporary Religion; Novo Religio: the Journal of Alternative and Emergent Religions and other academic journals dealing with religion. She has also written on gender and sexuality in Therav&da Buddhism. She is co-editor of The Anthropology of Friendship: Community Beyond Kinship, with Simon Coleman (Oxford: Berg, 1999) and Celibacy, Culture and Society: The Anthropology of Sexual Abstinence, with Elisa Sobo (University of Wisconsin Press, in press). Michel Clasquin lectures in the Department of Religious Studies at the University of South Africa. A practicing Buddhist since 1984, he is currently not affiliated to any Buddhist group. Gil Fronsdal teaches at the Sati Center for Buddhist Studies in Palo Alto, California. He has a doctorate in Buddhist Studies from Stanford University. He is a Buddhist meditation teacher teaching at the Insight Meditation Center of the Mid-Peninsula, also in Palo Alto and at Spirit Rock Meditation Center in Marin County, California. Ian Harris was educated at the Universities of Cambridge and Lancaster. He is a Reader in Religious Studies at St. Martin's College, Lancaster and co-founder (with Peter Harvey) of the UK Association for Buddhist Studies. The author of The Continuity of Madhyamaka and Yogacara in Early Mahayana Buddhism (1991) and editor of Buddhism and Politics in Twentieth Century Asia (1999), he has written widely on Buddhism in the modern world with particular reference to environmental ethics. He is currently working on a study of Buddhism in Cambodia, to be published by the University of Hawaii Press in 2001. Bruce Matthews is the C.B. Lumsden Professor of Comparative Religion at Acadia University, Nova Scotia. A former Commonwealth Fellow in P&li and Buddhist Civilization at the University of Ceylon, Peradeniya, he completed his graduate studies at McMaster University, Ontario. The author of Craving and Salvation: A Study of Buddhist Soteriology (1983) and many articles, his research now focuses on Buddhism and politics in Sri Lanka and Myanmar. David L. McMahan is an Assistant Professor in the Department of Religious Studies at Franklin & Marshall College. He has also taught at the University of California, Santa Barbara and the University of Vermont. He is the author of Empty Vision: Metaphor and Visionary Imagery in Mah&y&na Buddhism (Curzon Press, 2001); "New Frontiers in Buddhism: Three Recent Works on Buddhism in America," Journal of Global Buddhism 1 (2000); "Orality, Writing and Authority in South Asian Buddhism: Visionary Literature and the Struggle for Legitimacy in the Mahayana," History of Religions 37, no. 3, 1998; and "A Long Awaited Call: A Buddhist Response," in Ethics and World Religions: Cross-Cultural Case Studies, edited by Regina Wentzel Wolfe and Christine E. Gudorf (Maryknoll: Orbis Books, 1999). Franz Metcalf received his Ph.D. from the Divinity School at the University of Chicago, writing his dissertation on American Zen practice. He has published scholarly work on both contemporary Buddhism and the psychology of religion. He is book review editor for the Journal of Global Buddhism; co-chairs the Person, Culture, and Religion Group of the American Academy of Religion; and teaches comparative religion at California State University, Los Angeles. Franz is a founding member of the Forge Institute for Spirituality and Social Change, and author of two books applying Buddhist teachings to contemporary life. Lionel Obadia is lecturer in anthropology in the Charles-de-Gaulle University of Arts and Social Sciences at Lille (France). He is the author of Bouddhisme et Occident. La diffusion du bouddhisme tibétain en France. (L'harmattan, 1999) and of a general introduction Le Bouddhisme en Occident (Presses Universitaires de France, forthcoming 2001). He has published articles, reviews and edited the special issue Le bouddhisme en Occident: approches sociologique et anthropologique of the Belgian journal Recherches Sociologiques (2000/3). Douglas M. Padgett is a Ph.D. candidate in the study of religion at Indiana University, where he has concentrated on East Asian Buddhism and issues relating to identity, migration and religion,. He is currently working on a dissertation on Buddhism in Vietnam and in overseas Vietnamese communities. Charles S. Prebish is Professor of Religious Studies at the Pennsylvania State University. He is the author of eleven books, including the recently published Luminous Passage: The Practice and Study of Buddhism in America. He is a founding Co-Editor of the online Journal of Buddhist Ethics and Journal of Global Buddhism. He is a former officer and member of the board of directors of the International Association of Buddhist Studies, and has held the Numata Chair of Buddhist Studies at the University of Calgary, as well as a Rockefeller Foundation National Humanities Fellowship at the Centre for the Study of Religion at the University of Toronto. Christopher S. Queen is the dean of students for continuing education and lecturer on the study of religion in the Faculty of Arts and Sciences, Harvard University. He has edited and contributed to Engaged Buddhism in the West (2000), American Buddhism: Methods and Findings in Recent Scholarship (with Duncan Ryjken Williams, 1999), and Engaged Buddhism: Buddhist Liberation Movements in Asia (with Sallie B. King, 1996). He is currently working on a monograph on the life and teachings of B. R. Ambedkar and the rise of engaged Buddhism. Richard Seager holds a Ph.D. in the Study of Religion from Harvard University. He has written The World's Parliament of Religions: The East/West Encounter, Chicago 1893 (Indiana University Press) and Buddhism in America (Columbia University Press), and is currently Associate Professor of Religion at Hamilton College in Clinton, New York. Judith Simmer-Brown, Ph.D., is chair of the Religious Studies department at N&ropa University, where she has been a faculty member since 1978. She is also an &c&rya (senior teacher) in the Shambhala Buddhist lineage of Chögyam Trungpa, Rinpoche of Tibetan Kagyü/ and Nyingma Buddhism. In 1981, she organized the very first symposium which launched conversations on women in Western Buddhism, and has been part of the conversation between communities ever since. She writes on American Buddhism, Buddhist-Christian Dialogue, women and Buddhism, and is author of Dakini's Warm Breath: The Feminine Principle in Tibetan Buddhism (Boston: Shambhala Publications, 2001). Michelle Spuler is an Assistant Professor at Colorado College. She formerly taught in the Department of Religious Studies at the Victoria University of Wellington, New Zealand. She received her Ph.D. on the development of Zen Buddhism in Australia from the University of Queensland in Brisbane, Australia. She is currently working on a book based on her doctoral thesis. Ajahn Tiradhammo was born in Canada in 1949. He was introduced to Buddhism at university and, during a trip to South Asia in 1971, learned meditation in Sri Lanka. He then travelled to Thailand in 1973 to further meditation practice. There he undertook ordination as a novice and, in 1974, as a bhikkhu. Seeking further meditation guidance he studied with Ajahn Chah for 6 years before moving to the western branch monastery in Britain under Ajahn Sumedho. He spent 6 years as one of the senior monks in several of the branches in Britain then, in 1988, helped establish a new monastery in Switzerland where he has been resident for the last 12 years. Karma Lekshe Tsomo is Assistant Professor of Theology and Religious Studies at University of San Diego. An American nun practicing in the Tibetan tradition, she is secretary of Sakyadhita: International Association of Buddhist Women and has been active in the international Buddhist women's movement. She completed her doctorate in Philosophy at the University of Hawai'i with a dissertation on death and identity in China and Tibet, and has edited a number of books on women in Buddhism, including Sakyadhita: Daughters of the Buddha, Buddhism Through American Women's Eyes, Innovative Buddhist Women: Swimming Against the Stream, Sisters in Solitude: Two Traditions of Monastic Ethics for Women, and Buddhist Women Across Cultures: Realizations. Thomas Tweed is Professor of Religious Studies at the University of North Carolina at Chapel Hill, where he also serves as Associate Dean for Undergraduate Curricula. He has authored or edited four books on religion in North America. He edited Retelling U.S. Religious History (University of California Press, 1997) and co-edited, with Stephen Prothero, Asian Religions in America: A Documentary History (Oxford University Press, 1999). He also wrote The American Encounter with Buddhism, 1844—1912: Victorian Culture and the Limits of Dissent, which was originally published in 1992 and recently reissued in a revised edition with a new preface (University of North Carolina Press, 2000). His ethnographic study, Our Lady of the Exile: Diasporic Religion at a Cuban Catholic Shrine in Miami (Oxford University Press, 1997), won the American Academy of Religion's Award for Excellence. Frank Usarski, Ph.D., between 1988 and 1997 lectured at German universities in Hannover, Oldenburg, Bremen, Erfurt, Chemnitz and Leipzig Since 1998 he has held an appointment as a long-term visiting professor at the Pontifical Catholic University (PUC) of São Paulo, Brazil. Among the projects he has undertaken at the PUC was to found a research group on Buddhism in Latin America, which is current focusing its investigations on the history and contemporary situation of Buddhism in Brazil. B. Alan Wallace began his formal studies of Tibetan Buddhism and language in Germany in 1970, and he has been teaching Tibetan Buddhist philosophy and meditation in Europe and America since 1976. Ordained as a Buddhist monk for fourteen years, he has trained under and served as interpreter for many eminent Tibetan scholars and contemplatives, including His Holiness the Dalai Lama. He completed his undergraduate education at Amherst College, where he studied physics and the philosophy of science; and he earned his doctorate in Religious Studies at Stanford University, where he pursued interdisciplinary research into ways of exploring the nature of consciousness. He has written, translated, edited, or contributed to over thirty books on many facets of Tibetan Buddhism and culture, as well as the interface between religion and science. He presently teaches courses on Tibetan Buddhism and the interface between science and religion in the Department of Religious Studies at the University of California, Santa Barbara. Sylvia Wetzel (born 1949) is a high school teacher for politics and language, and since 1977, for the study of Buddhism. She worked for twenty years in Buddhist institutions: centers, publishing companies, as a board member of the German Buddhist Union (DBU), editor of Buddhist quarterly Lotusblätter, as a fulltime lay teacher of relaxation, meditation and Buddhism in Europe, founding member of Sakyadhita (Bodhgaya 1987), Network of Western Buddhist Teachers (Dharamsala 1993), and Women Awake (Köln 1999). She is currently initiating a non-profit "International Buddhist Academy" (Berlin (2000). Duncan Ryjken Williams received his Ph.D. in the study of Buddhism at Harvard University and is currently Assistant Professor of Japanese Religions and Culture at Trinity College. His research interest include medieval and early modern Japanese Zen Buddhism, the relationship between Buddhism and hot springs, and the history of Japanese American Buddhism. His recent publications include two co-edited volumes: American Buddhism: Methods and Findings in Recent Scholarship (Curzon Press, 1998) and Buddhism and Ecology (Harvard University Press, 1997). This recent, dramatic growth in Western Buddhism is accompanied by an expansion of topics and issues of Buddhist concern. 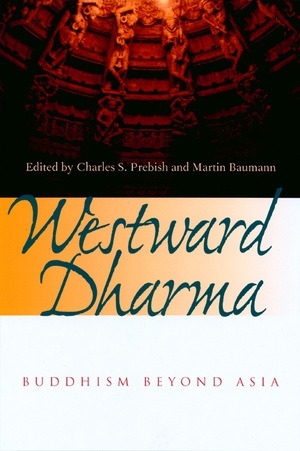 The contributors to this volume treat such topics as the broadening spirit of egalitarianism; the increasing emphasis on the psychological, as opposed to the purely religious, nature of practice; scandals within Buddhist movements; the erosion of the distinction between professional and lay Buddhists; Buddhist settlement in Israel; the history of Buddhism in internment camps; repackaging Zen for the West; and women's dharma in the West. The interconnections of historical and theoretical approaches in the volume make it a rich, multi-layered resource. Charles S. Prebish is Professor of Religious Studies at Pennsylvania State University and author and editor of numerous works, including Luminous Passage: The Practice and Study of Buddhism in America (California, 1999), A Survey of Vinaya Literature (1994), and American Buddhism (1979). He is coeditor of The Faces of Buddhism in America (California, 1998) and the electronic Journal of Buddhist Ethics. Martin Baumann is Professor of the History of Religions at the University of Lucerne, Switzerland, and research fellow in the Department of Religious Studies at Hannover University, Germany. He is the author of Diaspora: Hindus and Trinidad (2002), Migration, Religion, Integration (2000), and Deutsche Buddhisten: Geschichte and Gemeinschaften (1993). He is also coeditor of Religions fo the World: A Comprehensive Encyclopedia of Beliefs and Practices (2002). Prebish and Buamann are coeditors of the electronic Journal of Global Buddhism (http://www.globalbuddhism.org). "Westward Dharma deserves a place on the growing bookshelf of contemporary Buddhist studies. Prebish and Baumann broaden our horizons from North America to the wider Western world, exploring key aspects of Buddhism's most recent geographical and cultural expansion. "—Paul David Numrich, coauthor of Buddhists, Hindus, and Sikhs in America.